Neighbours were further perplexed at the youngster spending so much time scouring rubbish tips. Can it be long before the film rights to the triumph-over-adversity story are snapped up, and William Kamkwamba, the boy who dared to dream, finds himself on the big screen? We asked for your reaction to this story. Please find a selection of your comments below. Kudos to this lad for his perseverance. The answers to Africa's problems lie within - not from well meaning do-gooders from the West giving continual handouts. He'll go far and probably end up as prime minister of Malawi. This remarkable example shows how much of a contribution one could make by taking an initiative with a sound vision. My response? I am in (joyful) tears. This is a great example of perseverance and steadfast hope despite "dire" circumstances. It also affirms the need to share education and technology, to empower people to find sustainable solutions to their circumstance. Thank you for your perseverance and positive spirit to help your own people. May people like you multiply. This story is splendid, it is solid. It is what the whole of Africa should hear and learn about. It will ignite a new spirit in the continent's young minds who badly need such inspiration to get Africa going. Accomplishing something out of obscurity and carving a place for yourself in history like this Malawian shows that the human potential can never be limited, thus Africa could change if this mindset is nurtured and developed. Amazing triumph of the human spirit over adversity. What a remarkable and staggeringly honourable young man. I am inspired and humbled by him. I hope this fabulously positive story goes on to change the negative attitudes that have plagued Africa. Made my day! I love what this boy has done because he has used his own innovative ideas to power a village. I work in rural Kenya and I will definitely use this story as a case study to the youth who feel so desperate to make something of their lives but don't often have anyone to look up to that made it with little education like them. He is a star for Malawi in this world of technology. This shows the potential of poor Malawi and Africa. There are many potential youths in Africa but poverty is hindering them to rise. It could have been a good idea that funds that got lost through corruption and wars were used to provide an environment for such potential intellectuals to achieve their God given dreams/capabilities. What a fabulous, heart warming story. Congratulations on all of your hard work. You will be an inspiration to everyone who reads or hears about your triumphs. One of my former students Leo who is from Shandong, will go to the Gobi Desert in Inner Mongolia to install wind turbines in November. While not wanting to detract from this chap's achievements, I'm very surprised that this is not already common across the region. On my travels to South America, and mainly Patagonia - where there is no concept of electricity or running water outside the main towns - people have been using windmills to pump water for livestock and themselves, as well as generate electricity, for decades. One would think that it was an obvious solution for NGOs and charities working in poverty and drought stricken countries. But good luck to William: well done! It is amazing for a school dropout to do such a thing. It should be a lesson to all Africans that nothing is lost, no matter what the situation. So Africans should all work no matter where they find themselves. God should enlighten him to do great things. Congratulations for publishing for once a positive story! Mr Kamkwamba was able to achieve his dream because he went to school and had the opportunity to have access to a library, but also because he believed that changes can be made. What a lesson to teach to our European youth who complain about everything, and have all the opportunities and but no will to use them positively. Such are the stories that Africa needs. Stories that can inspire and galvanise our youths to think big. And maybe shame our leaders to be positive in the interest of their people. Now that's inspirational and that's how you would change the world. Physically making changes and not all that political talk. Reading this almost brought tears to my eyes. What a great story - human determination in the face of real adversity. I feel humbled. Warm regards to the young man! Definitely a remarkable story. Who says one person cannot make a difference? It is certainly a story worth telling the world about as it inspires us to become the best that we can be, and never give up. My sincere congratulations to William! A young man that puts many adults to shame. Amazing story, but a shame BBC has not done it justice. For all the implications Mr Kamkwamba's remarkable story raises, the article's conclusions disappoint. The "boy" who "dared to dream"? Will he get a film deal? Is this really what one takes away from Mr Kamkwamba's achievements? A severely disadvantaged young person applied his effort and abilities to address a serious problem, and greatly improved his community's quality of life. His innovation is an inspiration to millions, exemplifying the kind of home-grown sustainable development western governments and NGOs have scrambled after (and spent billions on) for years, with marginal success. Mr Kamkwamba, and others like him, need more attention, support and resources to expand their work. Not speculation on their Hollywood prospects. At the very least, they deserve more mature, respectful coverage of their stories in the future. I just wish to say that if I were ever given the opportunity to meet William Kamkwamba I would express an enormous gratitude for allowing his story to circulate the world. 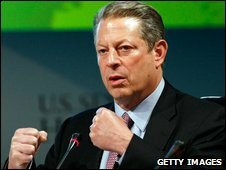 He serves as an inspiration to everyone, especially to our generation, the ones who are currently struggling to graduate and become what he has - an individual who has shown strength and endurance to positively influence his community as well as everyone else residing in other more technologically advanced areas of the world. Thank you Mr Kamkwamba! Our governments in Africa need to encourage these people. It is unfortunate that these people are not recognised and assisted accordingly. Imagine, I am in Malawi but I have learnt about this man through the BBC. That is what Africa truly wants. 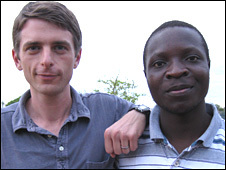 I am very proud by the deeds of Mr Kamkwamba. He has a wonderful mind. We shouldn't expect everything from someone else to teach us. If we look inside and use our potential, it is possible we can make a difference. Wishing you success in your future endeavours! God Bless you! This is a really inspirational story. So many young people get sidetracked when they find themselves in difficult life situations but this youngster has the resilience of our ancestors. He is truly a leader and a hero. Congratulations. It's amazing to see how much talent and commitment we have in this world, it seems this world could gain more if we were to concentrate more on the less fortunate and third world countries. I believe it's the only way forward rather dealing with the politicians. Wonder how many of this kind we have out there, together we can change this world just by looking to the next person to you and offering a hand or advice if you can. It is indeed a great joy to see a talented young African brother having a big dream to modernise his community with water and electrical supply. Africa has a lot of talented youths but there are no resources to work on. The intelligent poor children have no seats in the classroom and our greedy politicians are only looking after their own interests. Job well done my brother, I hope many will take your steps in the love of our own people. Let Africans think positively for our way forward and stop the killing and corruption. After all that effort: "Before long, locals were queuing up to charge their mobile phones." Sigh - and what did they use before? Kamkwamba's story is a story of defying impossibilities, determination and that is what the world needs!! Truly inspirational!! I'm an engineer with years of experience so I take my hat off!! Its so nice to hear something nice happening for once! Good on him and all those who he wishes to help. As a Malawi I feel great, and would appreciate very much if African governments can do more to support these many talented young ones. Kamkwamba is a gift from God. If it wasn't so, his idea could have not materialised, through the BBC. 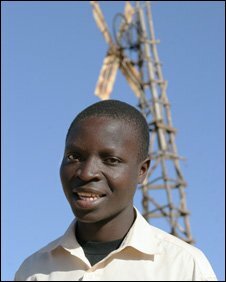 I would like his story to be published in every African country, so that gifted teenagers like Kamkwamba will come up. Congratulations Kamkwamba, I am really proud of you. Well done, and may Lord Bless you. There is so much hope for Africa and this young man shows what is possible with meagre resources. We do not have to wait for corrupt governments, officials or donors to sort out, we just need to go back to basics. So proud and so challenged!! I'm living in Malawi at present. Unless you've lived here you can't possibly understand just what an amazing achievement it is! I live in a city and the electricity cuts out most nights. What an inspirational story! He has shown the world, especially Africa, that the development and progress of Africa lies in the hands of Africans. Africans must dig deep into their skills and talents, using them to build their communities and nations as a whole. Nothing stopped him, despite the obstacles and challenges he encountered. I am very proud of him and if he should set up a development fund I will definitely take part because it will be for a good cause.